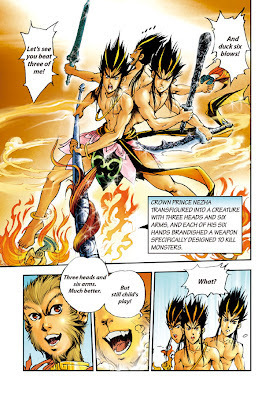 I recently was given access to some previews of the first two volumes of JR Comics' Monkey King series. I discovered the character of the Monkey King 6-8 years ago -- oddly enough, after blindly stumbling across an eBay auction of a small statuette of him. He's a character of Chinese legend and has shown up in all manner of media over the years; I think most recently a version of the character has even been incorporated into the Marvel continuum. I certainly haven't studied all there is to know about the character, and the various permutations of his stories, but I think it's safe to say I have more than a passing familiarity with the character. Now here's where I start getting confused. The previews I got showed Volume 1 would come out in early September and Volume 2 would be a week later. A cross-sell page in the back shows 20 volumes in all. The website shows the same 20 volumes, but provides no release dates at all. No news of any kind, for that matter. Meanwhile, the Amazon lists say all 20 books have been in stock since January 1 and an interview I read with the publisher says they've been available since last November. So I have no idea if they're actually available or not right now. Confusion point 2. Here's a two page spread from Volume 2... What is up with those fonts? Let's assume for a moment that the translation work is not being done in the U.S. JR Comics is actually a Korean company, so I can see that maybe they might not be completely versed in Western fonts and they might not know the full breadth of options available for fonts that look somewhat hand-drawn. I mean, judging from their marketing and whatnot, it frankly looks like a small company looking to make a fairly quick buck on what they see as easy translation work. Fine. But they clearly recognized there was a basic need for something like that as they've chosen Comic Sans for the captions. But then they use a bold san serif for all the dialogue? What's more, there was clearly a deliberate font selection there. I know I'm a bit rusty, but I can still tell it's definitely not Helvetica, Arial, Univers, Gill Sans, Verdana, Futura, or any of the other somewhat standard san serifs available. So they made a deliberate choice on that, but... why? I mean, I'm sure there are plenty of worse fonts they could've gone with, but it does not make for a comfortable read over these 150+ page books. Confusion point 3. Their website. Seriously, why bother with one at all if you're not going to put a single piece of information (not even a link!) about how/where a reader might buy these books? There's also no mention at all of any of their other titles: Romance of the Three Kingdoms, Water Margin and Dream of the Red Chamber. Add in zero navigation back to the site once you're in any of the previews, and this just makes no sense. Now, that said, I am still interested in these books. Primarily for the character. The first two volumes do read well (despite the fonts) but they are very admittedly written for a Chinese audience. I think someone unfamiliar with Chinese story style and structure might be put off a bit by this. It's definitely not Japanese or Korean, so it might not click for fans of manga or manhwa either. But if you did see Sun Wukong pop up in Iron Man recently and wonder what the hell he's all about, this story will definitely provide you with that background. I've only seen the first two volumes, as I said, but it appears the series will recount all of the Monkey King's tales from Journey to the West. The storytelling does strike me as very reminiscent of the legends as I've heard them, and I would like to pick these all up to see the full story illustrated. Wei Dong Chen and Chao Peng do a great job writing and drawing the story; I just wish the publisher left me scratching my head over its publication. 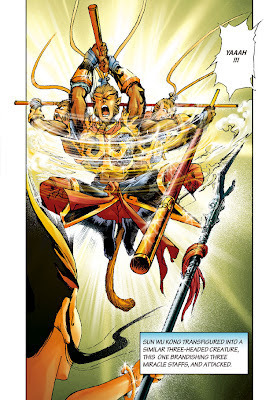 The Monkey King also made an appearance in Gene Yang's 'American Born Chinese' back in 2006. Actually, my original interest in the Monkey King coincided with Yang's working on ABC. I came across his site before ABC was finished (or at least before it was published) because he had posted some of his Sun Wukong sketches on his site. There's also a Katsuya Terada manga that Dark Horse published in 2005 titled The Monkey King but this diverges a bit from the myths and gets pretty gory. I believe they JUST published vol. 2 a couple months ago, but I haven't seen/bought that yet. Cool, that coincidence worked out then. 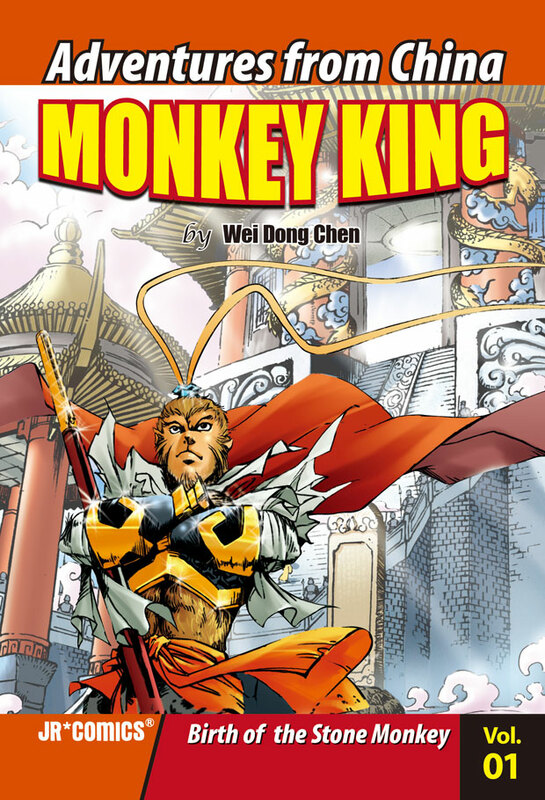 Also, if I'm not mistaken, didn't Udon Comics do a Monkey King back in the early 00s? I have this vague recollection, but I can't pinpoint exactly who published it, I just remember that it had that American-Manga-Hybrid style.